“Blessed be the God and Father of our Lord Jesus Christ! According to his great mercy, he has caused us to be born again to a living hope through the resurrection of Jesus Christ from the dead,…”. The Boston bombings were a volcanic moment of chaos erupting out of the the deep lava flow of human sin. The magnitude of the event was shocking. The fact that it happened is not. Chaos and mayhem are scattered across the world on any given day in ways great and small. How do we respond? Some argue cynically that ‘Life is one darned thing after another.’ History moves in a circular motion from Herod to Hitler to Mao to Bin Laden. Nothing really changes. The best you can do is find your little haven of safety somewhere, look after yourself and let the world be damned. Others see life as a slippery slope. The best is behind us. What lies ahead is degrading, without prospects. They look longingly back to the ‘good ol’ days’ when life was as it should be. The future is bleak, despairing. It is best to live without expectations. These views are common and perhaps even understandable. You and I may even resort to them from time to time. But they can in no sense be called Christian. The Christian response to the broken world takes its language from the cross and resurrection of Jesus. It is the language not of cynicism or despair but of hope. 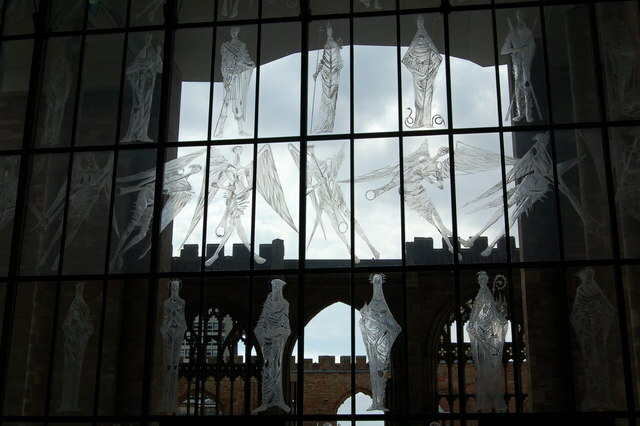 Coventry cathedral was destroyed during the second world war. When the new church was built, adjacent to the old structure, it included a magnificent wall of glass. On the wall are the images of saints and angels, gathered together in a glorious celebration. Through the glass wall one can see the remains of the old buildings, grim reminders of the effects of human evil. So, Christian, grab your trumpet, warm up your voice and let’s celebrate that great and glorious future God is preparing for us, even as we give ourselves in service to the suffering and broken world. For God has promised that one day wars will cease, tears will be dried and we’ll be swinging on the chandeliers of heaven!